Cyclists now have to use the narrow pavements, already often congested with walkers, and totally unsuitable for bikes, prams, wheelchairs, and luggage-trolleys to pass each other. Some are holidaymakers struggling with suitcases, whilst others are commuters dashing (or trying to!) for their train. The message from the station to visitors and to the general public is appalling. What other major European station would corral 2-way walking – with bikes, prams, wheelchairs and luggage – into narrow passageways, whilst wide adjacent roadways are completely empty most of the time! The ban came immediately after the sad death of a pedestrian hit by a reversing car at the top of the south ramp. Yet no cyclists were involved and we know of no reported cycling problems on the north ramp, the official cycle access in recent months. Nor has Network Rail answered our request to inform us of any such incidents. 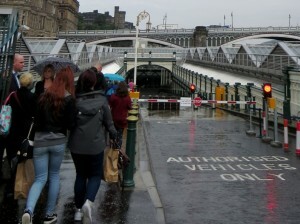 Different staff in Network Rail have given different reasons for the ban, the most frequent being that the north roadway must be for shop delivery vehicles and must be fenced off at the bottom so that they don’t crash into pedestrians. Spokes believes this is a serious over-reaction and there is scope for various alternatives which would easily allow safe cycling on one or other of the ramps. The whole mess is all the more unfortunate at a time when the Scottish Government is seeking greatly improved bike/rail integration in the forthcoming new ScotRail franchise – and when Network Rail itself is installing new Waverley bike parking near the north ramp, at Platform 19, and is rumoured to be looking into further cycling provision. Spokes has written to Network Rail, contacted MSPs and taken various other steps. Pressure is building from several directions and you can help greatly if you are concerned about this. Please write urgently to your MSPs asking them to take this up with Network Rail [www.writetothem.com]. Send us any useful replies. I cannot see how this is safe, and it does nothing to encourage more cycling. The many people who use Waverley daily with panniers or other accessories are going to struggle to squeeze through. The carriageway is of reasonable width and I urge that a proper risk assessment be undertaken. What you have imposed is absolutely unsatisfactory for both pedestrians and cyclists and I urge you again to please rethink. In the event of any need to evacuate the station and also during the Edinburgh Festival, this is a serious crush accident situation waiting to happen! From a customer letter to Network Rail [his specific questions not answered despite several follow-ups] … I would be grateful if you could provide me with any statistics of cyclist/pedestrian, cyclist/vehicular collisions when the previous arrangements were in place so I can understand the need for the additional safety measures you claim to have implemented. I would also be grateful if you could confirm if an independent transport assessment of the current arrangements has been commissioned so I can understand if the current arrangements justify the additional inconvenience and unsightliness. Yesterday, I witnessed pedestrians arguing (in a civilised fashion) with two European cycle tourists trying to negotiate their fully loaded bikes up the narrow pedestrian pathway on the north ramp at the station. Through the goodwill of others they made it through. Quite what the tourists thought of their introduction to Scotland?! A wide roadway with no traffic and everyone herded into a narrow walkway. A recipe for confrontation. I am a rail commuting cyclist, and having easy and reliable access to cycle parking at Waverly is essential to my daily travel choice to use rail. 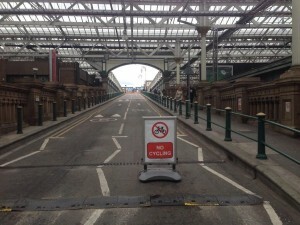 During the past 12 years, Waverley has been generally welcoming to cyclists – and as a consequence Scotrail has had many many hundreds of pounds of my money for rail fares. But in the past 12 months, this seems to be going backwards. [Spokes explains: this person, like many others, isn’t aware that Network Rail runs Waverley. So ScotRail’s reputation is suffering as a result of Network Rail’s actions]. Sarah Boyack MSP, Spokes member and former Labour Transport Minister, says I wrote to Network rail about the issue of cycle access to Waverley a few weeks ago, alongside comments about poor access generally. I’ll keep you posted re what sort of reply I get. Cllr Lesley Hinds, Edinburgh Council Transport Convener, has promised a constituent that she will raise this with Network Rail in person. Cllr Adam McVey, Edinburgh Council Transport Vice-Convener, has written to Network Rail. Transform Scotland has been taking up the case and is concerned about pedestrian as well as cyclist access via the ramps and the fencing at the bottom. Inclusion Scotland [a consortium of organisations of disabled people & disabled individuals in Scotland] retweeted one of our tweets. 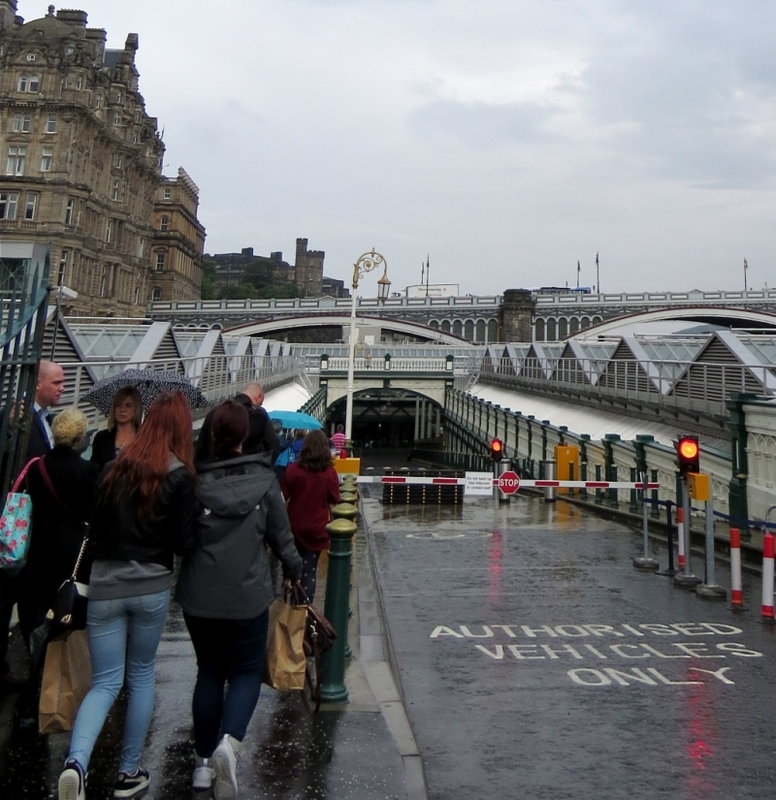 They are particularly concerned about other Waverley access aspects, for people with disabilities.